Program Graph Digitizer has english interface,intends for digitization of orthogonal graphs (from book, papers). The input graph image file should be in bmp, jpg, tif or gif format. 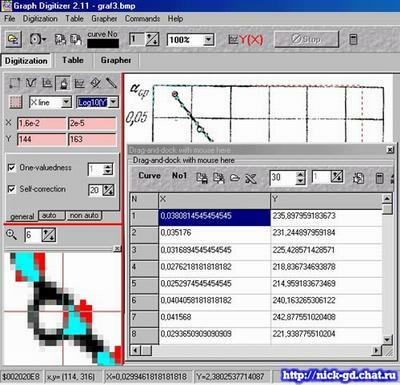 Image of the graph can be scanned or pasted from clipboard. A bad image map can be edited and rotated. A tie to real coordinates of chart implements by allocation of rectangular area and coordinates setting of two points - left-bottom and righ-top corners of this rectangle. There are three modes of digitization. Auto digitization - you define curve color and area of search (the red rectangle) and press button "Auto digitization in rectangle area". Semi-auto digitization - when you press button "Search in area" and move cursor on (along) a curve. Manual digitization - you press button "Manual input" and click in curve, the value is recorded in the table. Data Y(X) from the Table may be displaed in Grapher or saved in data-file format.